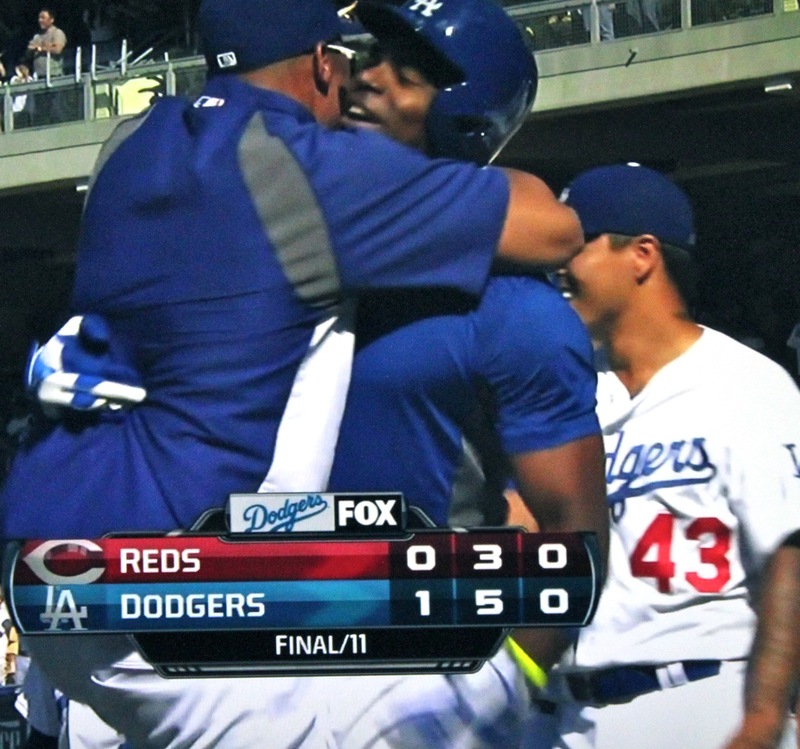 Matt Kemp greets Yasiel Puig after his walk-off home run. We struck out more than ever before (20 times altogether). Several players whiffed three times! One of them was Yasiel Puig. But you know what? The only at-bat that mattered was the last one, when the Manna From Havana sent an 0-1 pitch into the left-field pavilion in the 11th inning and then slid home to avoid the human wrecking balls that his teammates had become as he rounded the bases. With the 1-0 win, the Dodgers took the series from the Cincinnati Reds, a really good team with the best bullpen in the National League. Their pitchers were good. Starter Tony Cingrani fanned 11 Dodgers all by himself. But in the end, ours were just a little bit better. Starter Chris Capuano allowed just three hits in 6⅔ innings, and then Ronald Belisario, Paco Rodriguez, Kenley Jansen and Brandon (I take back every bad thing I’ve ever said) League blanked them through the last 4⅓. League even notched his third consecutive win. Amazing! Gearing Up for Opening Day! Chris Erskine on Only in L.A.